In Lx Factory (check the Lx Factory article) there is a place that was born from the old factory workers’ recreational room. A gastropub as they call it, named Rio Maravilha. It translates as Wonder River, and I’m sure you can guess which river they are referring to! With a breath-taking view that embraces the other margin and the Christ the King statue (like they are hugging at a distance) it also pays tribute to Brazil’s Rio de Janeiro. The concept joins together all visitors in a cool and friendly atmosphere, promoting encounters and conversations around big colorful tables. The decoration is very original and fun (please do check out the bathroom). You can have a Portuguese/Brazilian meal while you play board games at the table, sit at the balcony tasting lighter appetizers, or just go up to the top floor for drinks and tasteful music. 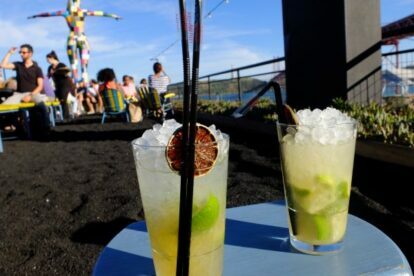 My personal favorite is going with a friend and enjoying the view alongside another good old friend of mine: the Caipiroska! Which, by the way, is very well made here – and not expensive. There are other drinks, cocktails, fruit juices, traditional beer and wine, for all tastes and wallets. And you will never regret watching the sunset from here as the city starts lighting up for the evening. Offline Lisbon tips? Get our iPhone / Android app!